Dennis and SISIS have confirmed their attendance at the Sports Turf Managers Association (STMA) conference & exhibition in San Diego on January 21 & 22. Dennis and SISIS have confirmed their attendance at the Sports Turf Managers Association (STMA) conference & exhibition in San Diego on January 21 & 22, and will be a bringing a number of market leading products to their joint stand - number 749. Last year, the event, held in Denver, saw a record 200 exhibitors and 1,200 attendees from nine different countries, and this year, show organisers will be hoping to beat records yet again. With a great line up of exhibitors and powerful education programmes, the event is a great way to discover how to maintain sports fields. Dennis and SISIS’ machines are used at high profile international stadia around the world. A visit to the joint stand will provide visitors with a fabulous insight into the array of world-class turf maintenance products manufactured by the British innovators. In an impressive line-up, Dennis will be showcasing its G860 dedicated cylinder mower, complete with range of interchangeable cassettes. This mower has become the number one choice for groundsmen around the world and was used at the last two FIFA World Cup’s held in South Africa and Brazil. The G860 features a large diameter front roller with an adjustable scraper which has been designed for a precise height of cut control, giving an excellent finish. Weighing just 166kg, it is light and extremely versatile due to the interchangeable cassette system. With a simple one minute changeover, users have the option of fitting eleven different types of heads including scarifiers, verticutters, brushes, spikers, slitters and cutting cylinders. SISIS products on display include the Quadraplay and Towed Implement Frame systems. 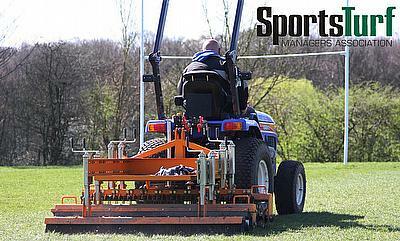 The SISIS Quadraplay is a single pass maintenance system which incorporates a mounted frame for up to four implements such as grooming rakes, spikers, slitters, rollers and brushes, which means that it can be used for fine and outfield turf to perform a range of tasks. The SISIS Towed Implement Frame is designed specifically for daily maintenance of synthetic surfaces, keeping them in good playing condition and maximising surface life. Ideal for towing behind small, compact tractors this versatile piece of equipment can also be fitted with a number of implements including the Flexicomb and Straight Brush – which will also be on display. Designed primarily for use on synthetic surfaces, the Flexicomb ensures even distribution of infill materials and lifts the pile. The adjustable setting ensures the effect of a rake, but with the softness of a brush, reducing the risk of damage to the fibres. Adjustment is quick and simple and the bristle sections are replaceable meaning that the Flexicomb can endure a long working life with minimal maintenance. For perfect results, a combined brush system of the Flexicomb and Straight Brush is recommended as the Straight Brush will provide a nice level finish following the hard work of the Flexicomb.